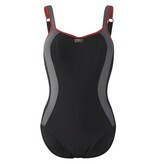 Save 45% on this ultimate sports swimsuit with integrated cups for full support from a DD-H cup. The Xtra Life Lycra fabric stands up to chlorine and oils and the textured sports mesh side panels give the suit a sporty look as well as a streamlined silhouette. This swimsuit would be perfect for athletes with large cup sizes. Like the Panache Sports Bra, the straps offer an option to clasp mid-back for a racerback look and additional support.